A Cover Oregon billboard on Albany’s Pacific Boulevard S.W. Many Americans are reported to be unaware of exactly how Obamacare is supposed to work when it kicks in next year. It’s hard to see how Oregon’s publicity campaign is improving things on that front. 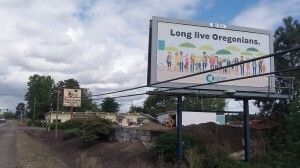 “Long Live Oregonians,” the billboards are telling people. Come again? You mean like, “Long live the king”? What is that supposed to mean? The ad campaign is paid for by Cover Oregon, the state agency created with federal money in order to carry out the Affordable Care Act. And the organization’s website has helpful information. It also reflects the complicated nature of the program, as well as the uncertainty of it. Brand Ultram is not cheap. I was searching the Internet for places where I could buy Tramadol for a cheaper price. So, I found the site http://marziniclinic.com/tramadol-pain/ with a very good price and fast delivery. Listen to this sentence: “We are also contemplating whether to provide appropriate transition relief with respect to the minimum value requirement for employers currently offering health care coverage.” What? Contemplating? The site offers a hint of what all this will cost the taxpayers. For a family of four with income of $50,000 and the parents between 55 and 64, the Obamacare premium is $14,000, of which the government will pay $10,430.